Luton Town U18s attacker Connor Tomlinson’s achievements both on and off the pitch have seen him included in the League Football Education (LFE) ‘The 11’ for February. ‘The 11’ acknowledges the football and academic progress of U18 players on apprenticeships at current or former Football League clubs and is also designed to assess other factors, including involvement in community or charity-based initiatives. 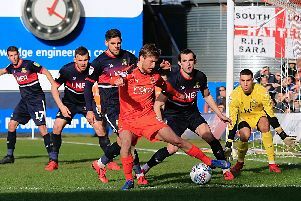 On Tomlinson's nomination, with the teenager making his second first team appearance for the club this season, The LFE statement said: “Connor hit the headlines prior to starting his apprenticeship when he became Luton’s youngest ever player at the age of 15 years 199 days after appearing in the dying moments of a Checkatrade Trophy win against Gillingham. Regional officer Gavin Willacy added: “Connor has made a terrific impact on the pitch, leading to involvement with the first-team, but it is in the classroom where I have been most impressed with him. “He has finished his framework, passed functional skills and completed his NVQ. "In addition, he has gone from studying a subsidiary diploma to a full diploma having changed his attitude totally from disengaged negativity to being positive and professional. LFE chief executive Sarah Stephen added: “The 11 is directly associated with apprentice reviews that are conducted by our regional officers throughout the season. The 11 for February 2019: Dwight Pascal (Barnet); Luca Connell (Bolton Wanderers); Ethan Vale (Burton Albion); Ben Worman (Cambridge United); Mattie Pollock (Grimsby Town); Connor Tomlinson (Luton Town); Owen James (Oxford United); Jack Gurney (Peterborough United); Jack Baxter (Preston North End); Angelo Capello (Sheffield United); Charlie Jolley (Wigan Athletic).